05.27.07 Current Maine State Co-Champion and Bates College English Professor Steven Dillon took a look at the recently published Fishbein - Spahn game from the scholastic team state championship earlier this year and was moved to write his own set of annotations. We are delighted and honored to receive this bit of instruction and insight from Professor Dillon. George Spahn (background left) shakes hands with Matthew Fishbein at the 2008 Scholastic Teams State Championship. To replay this game with our interactive game viewer click here. The relatively rare Ponziani opening, named after an 18th-century Italian. White wants to play d4 and if Black plays ed, then White can recapture with the c-pawn. White would have a beautiful pawn center after that. Well-played! Black refuses to let White get a big center for free. 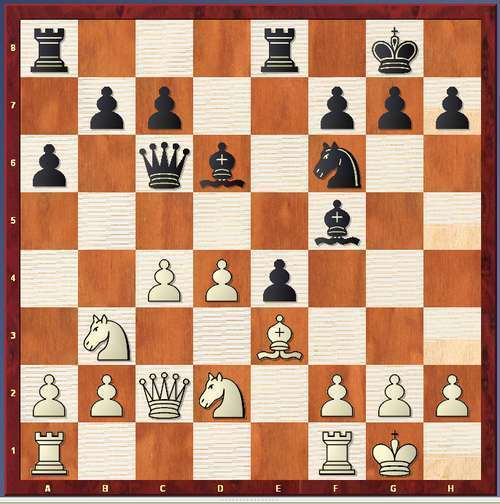 White usually tries for an advantage with tricky moves like Qa4 or Bb5. 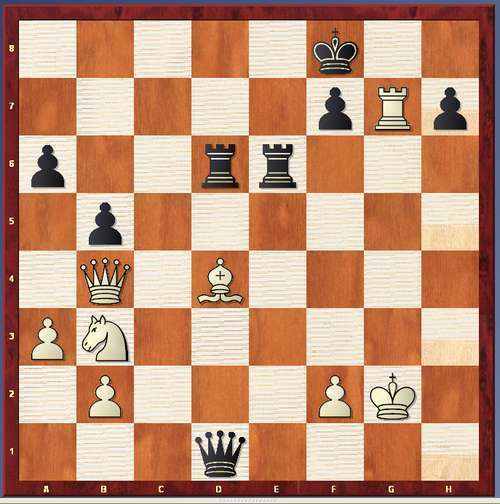 This is why c3 is rarely played so early; the pawn takes away the square from the Nb1. Black now has a good version of a center counter (1 e4 d5 2. ed Qd5). 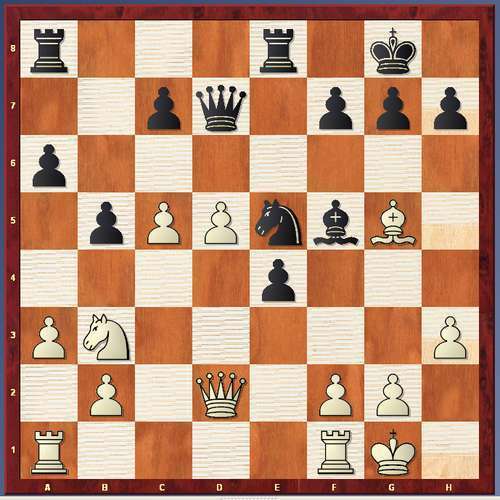 5. . . Bg4 is also possible, since White probably doesn't want to take de5. Sometimes it is good to keep the tension rather than release it. 6. . . f5 trying for a big center is an idea, although White can later try to break it apart with f3. Black is playing fluidly and naturally. Since the Queen is vulnerable now on c2, a better plan for White might have been Be2 or Bc4 with the idea of Nf1 to e3, to block the pawn. But Black is already way ahead in development. 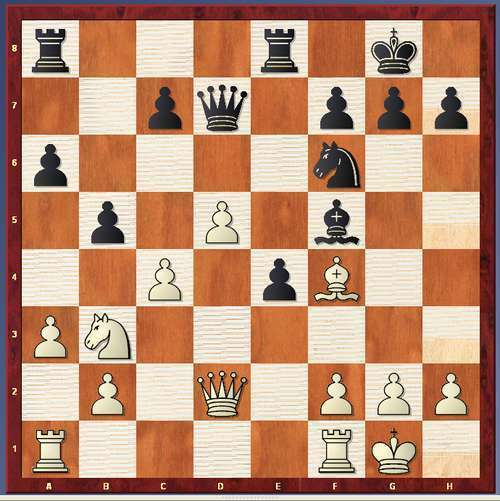 Qd6 is a reasonable square, but on Qd7 the Bf5 is still protected, which prevents f3. White wants to develop his queenside, but Nf1-e3 might be a more balanced way of doing it. The Nb3 can get in the way of a queenside pawn expansion. Probably the best square right now for the bishop. Black retains the option of castling either way. Safer than O-O-O, especially with all of White's pieces over there. Good move, protecting the strong point on e4. Black threatens to cause trouble with Ng4. Not really a threat; maybe h3. Exchanges the Bishop for a Knight, which isn't great, but exchanging pieces in a cramped position is often a good idea. With the bishop out of the way, White can claim his share of the center. But there is a tactical drawback. This bishop isn't going anywhere. No need to trade this nice bishop for a knight on d2. 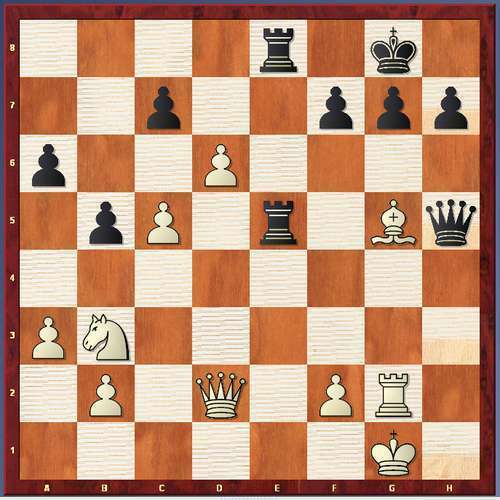 If the bishop wants to hide from the coming pawn storm, it could go to f8. But there is better. In the computer annotation, Fritz notices Bh2+! A line might go Bh2+ 16 Kh2 Ng4+ 17 Kg1 Qd6 18 g3 Ne3 and if 19 fe Qg3 20 Kh1 Re6 with Rh6 coming. Can readers improve White's defense? With the idea of getting the Nb3 back into the game with Nd4. May as well clear up the situation and win the strong dark-squared bishop for the knight. Good instinct! Go after the base of the pawn chain to break up the center. It is tempting to threaten to break up Black's kingside with Bf6. Fritz suggests 20 Nc5 Qe7 21 Qd4 to try and hold the center together. Chasing the knight where it wants to go. Maybe Rac1. Black threatens not only the c4 pawn, but a combination on h3. This takes care of c4, but not the kingside. A very interesting try which doesn't quite work here. Bh3 was simpler, with all kinds of threats coming. A good way to take this pawn. Fritz gives Re2 followed by doubling the rooks with Rae8. 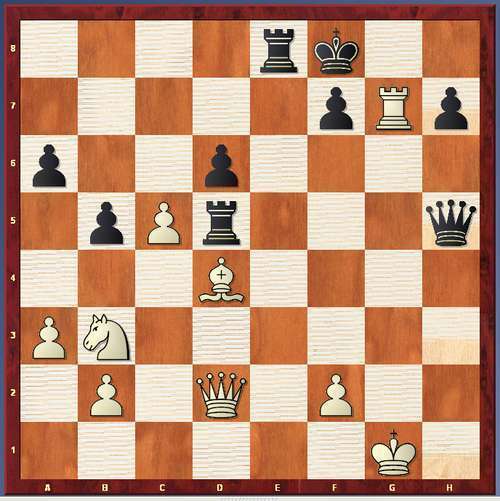 A good idea to push the advanced pawn, but Bf6 wins material. Be7 was a simpler way to block the e-file. Alertly attacking the queen and also the weak back rank. Stepping into an awkward pin, but also attacking g7. Going after White's dangerous advanced pawn instead of protecting his own g7 pawn. Qd4 Re1+ 36 Kg2 Qh1+ 37 Kg3 Rg1+ 38 Kf4 Qh6 39 Ke4 Qg7 where White is basically forced to trade queens, leaving Black with a winning endgame. White needs to keep the pin on. Letting the rook go free allows the following winning attack. An exciting, topsy-turvy battle between two very promising young players. definitely on their way up! At firt I thought it seemed somewhat long as it took 8 pages to print it out (I check everything throughly.) but by pqge 2 I got into it and I do say it was informative and well done. The comments make chess look easy and that is one the marks of a good annotater. I throughly enjoyed the comments. Thank you Professor Dillon and I hope to see further games annotated by you. Maybe a game a month would be nice.